My curiosity got the better of me and I found out something interesting. 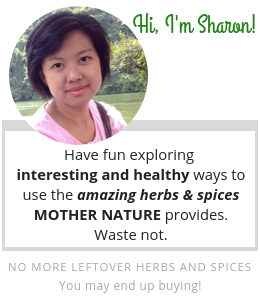 Here am I sharing with you how else to use your herbs – share with your dog! You will surely ask, ‘Really! Can dogs eat herbs?’. Why not? In fact, spices too. Herbs and spices add delectable flavours to our home cooked meals and give us the nutritional boost. Should you have more than enough to use, why not share them with our four-legged friend. A dog needs nutrition too. Find out how to spice up its meal with herbs and spices, keeping it healthy and flavourful too. On the other hand, there are herbs and spices that can hurt your dog. Read on to discover which. Yes! They can but not all. But why should they? Before we domesticated dogs, they are used as hunting companions and guardians. If not, they lived in the wild. They ran freely to exercise. Lived in the natural environment, eating fresh plants and grasses. Rolled in the dust and grass for the wellbeing of their skin and fur. Today, dogs live with their human friend in a confined environment. Undoubtedly, they are taken for their daily walk or a run at the designated park, it is still a vast different how their ancestors lived in ancient times. Your dog needs fresh plants for general health. Especially so for the fibre and roughage content. A repetitive diet of dry pellets or kibbles can cause constipation. 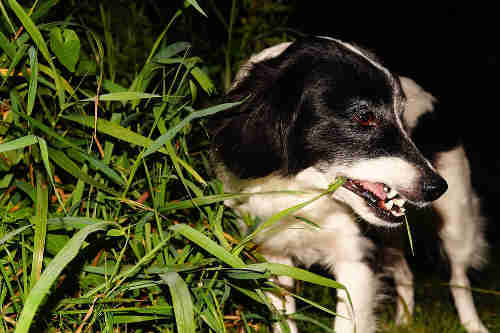 Dogs eating grasses are quite common and most veterinarians consider it a normal dog behaviour. Some people suggested that dog does so to improve its digestion, treat intestinal worm or find its nutritional needs, including the need for fibre. Not forgetting the health benefits of the fresh herbs, how they worked for humans, work for dogs too. 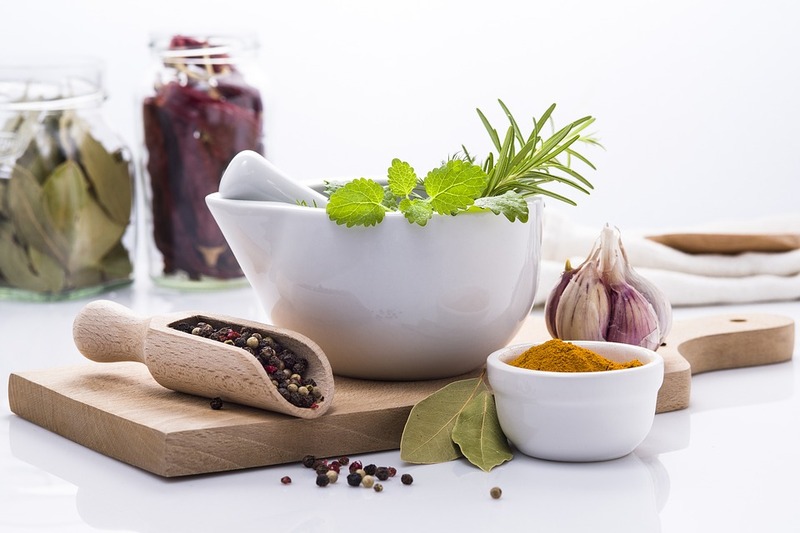 Fresh herbs and spices have antibacterial and antiviral properties. Also, most contain disease-fighting antioxidants. 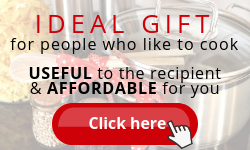 Therefore, you should introduce some herbs and spices into the life of your dog. 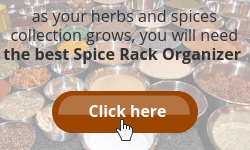 Click here to check out the list of herbs and spices and their health benefits. Now, let’s proceed to the next agenda you so eagerly want to know. This common cooking herb has antimicrobial, antiviral, antifungal and antioxidant properties. It is also a rich source of magnesium and Vitamin A. Your dog requires essential vitamins and minerals just like us humans. One of the key nutrients, magnesium, is involved with energy production at the cellular level. Every time your dog moves a muscle, including heartbeat or even having a thought, magnesium is needed to support the transfer of energy. This is a familiar herb to all. Very often thought of just as a garnish. You must know that parsley is, in fact, a very powerful herb that can provide vital nutrients for your dog. This leafy herb contains antioxidants, flavonoids and vitamins including lycopene and carotenes. It helps soothe stomach upset and act as a breath freshener. In addition, parsley’s diuretic properties may be helpful for urinary tract infections. With the increase in urination, bad bacteria gets flushed out of the bladder. At the same time, preventing renal gravel or stones from forming in your dog. This fragrant herb is high in Vitamin B6 and a good source of iron and calcium. In fact, rosemary is a very common ingredient in dog food. Mostly because it acts as a natural food preservative. 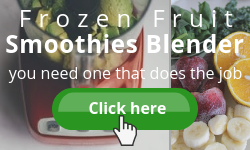 In addition, its antioxidant properties can help neutralize cell-damaging free radicals in the body. 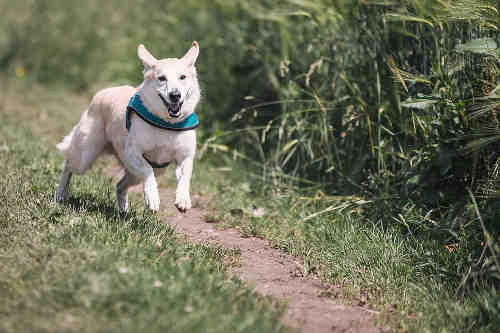 Does your dog like to run on grass or tromp through the bushes? This may leave your dog susceptible to fleas, ticks and bugs. In this case, rosemary can be used as a bug repellant. The end result of using this herbal wash is leaving your dog flea free, with a silky and glossy coat. Furthermore, smelling lovely. 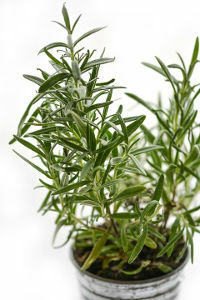 Add 2 cups of fresh rosemary leaves into 2 pints of boiling water. Continue to boil for 30 minutes. Let it cool completely before straining. You may throw away the leaves. Pour the strained herbal wash in a glass container with a lid. It is ready to be used. Any access can be stored in the refrigerator. Firstly, give your dog a good and thorough bath. Remember to wash any bedding or any flea-infested items too. Once your dog is rinsed, pour the completely cool rosemary water over its body. Ensure to cover areas where fleas are likely to congregate. You don’t need to rinse out the rosemary water. Let it dry naturally. You may consider using a spray bottle instead of pouring. Repeat the process when necessary. If your dog is already tromping through the bushes, why not the rosemary bushes? Rubbing against the rosemary plant will release the essential oils thus giving your dog a coat of protection on its fur and body. For this reason, will you grow your own herb or buy a live plant? This is another common cooking herb and it contains a high level of vitamin K. It is a fat-soluble vitamin that is necessary for overall health. Vitamin K assists in absorbing calcium. Hence, strengthen your dog’s bones and teeth. This is why vitamin K can be very useful if your dog is at risk of osteoporosis or related diseases. Additionally, thyme has antibacterial, anti-fungal and antioxidant properties. Surely you know what this amazing spice do to our health. The same benefits go to your dog too. Its powerful anti-inflammatory properties can be used to treat arthritis, which is the result of inflammation. Besides, it can also relieve the pain and stiffness in arthritis. In this case, using turmeric is much better than pain medications. Don’t you agree? In addition, turmeric is a powerful antioxidant, which is known to fight free radicals damage that can lead to negative effects on health. You must know that free radical damage accumulates with age. Antioxidants can neutralize free radicals and help to decrease the damage. This is another common and well-known aromatic spice. Cinnamon has antifungal properties which help to combat the fungus which causes yeast infections. Furthermore, cinnamon helps to regulate blood sugar which is essential for older or overweight dogs that are at risk of contracting diabetes. If you intend to use cinnamon for your dog, please be sure to use Ceylon cinnamon, instead of Cassia cinnamon. Compared to Cassia cinnamon, Ceylon cinnamon’s low levels of coumarin makes it a better choice to use as a medical supplement. Click here to find out more about cinnamon. Now you know that you can share the abovementioned common herbs and spices with your dog, ‘how to’ is the next question. It is relatively simple to spice up its meal with herbs and spices. Whether making your own dog food or store bought – canned or kibble, simply sprinkle spices or finely chopped fresh herbs on top of the food. Before fully incorporating herbs and spices into your dog’s diet, it is important that you introduce one new herb or spice at a time. Wait and monitor your dog’s reaction for a few days before introducing the next. Allergic reactions can range from a runny nose and eyes, sneezing, itching, swelling, diarrhoea or vomiting. Moving on to the important part. There is quite a number that is not safe for dogs such as comfrey, mace, pennyroyal, tea tree oil among others. Let’s take note of those that are commonly found in our kitchen or spice cabinet. Chives can cause stomach and gut irritation and potentially lead to red blood cell damage and anaemia. Onion powder or onion in any form can cause stomach upset, diarrhoea or vomiting. Nutmeg can cause severe stomach upset and agitation in the nervous system. Paprika can cause skin and eye irritation. With this knowledge, I hope you will be extra careful incorporating herbs and spices into your dog’s diet. All of us know very well that herbs and spices enhance the flavour of our food. Furthermore, they are rich in all the important vitamins, minerals and many other healthy components to maintain and boost our overall health. Now you know the same will benefit your dog too. Having said so, by no means you can feed your dog freely with herbs and spices. Refer to the safe herbs and spices listed above, always start with a small amount and monitor the situation closely. Also, you must take notice that as with human, all dogs are different. What works for one dog may not work for another. If in doubt, check with your veterinarian. More so if your dog is under medication as some herbs and spices may interfere or contradict the effectiveness of the medication. In any case, it is important to keep your dog safe. In the end, can dogs eat herbs? I hope this article has given you the answers. If you have more than enough of fresh herbs for cooking, would you want to share with your canine friend? Besides being healthy for both yourself and your dog, there won’t be much wastage. Isn’t this a prudent way to utilize your fresh herbs? Please share your thoughts in the comments section below. It will be interesting to find out how you feel. 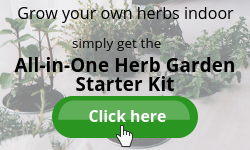 For some reasons you may want to use herbal supplements for your dog, with the advice of a veterinarian, there are a variety of herbal supplements or health food which you can conveniently buy on Amazon. Let’s spice up your dog’s food, with care! I have seen dogs and cats chew on grass and herbs! Now I know why. This is very interesting! I must pass this on to my friends who own cats and dogs. I used to own dogs, then cats, and then dogs. The last doggy friend I had was Perdy, my mini schnauzer. After she passed away, I decided not to have any pets for a while. Cos started to get busy with my business. I feel it is not fair to our pet friends if I cannot have time for them. I do believe in future I will have a doggy friend again when my business schedule ease. And this article will help me to take better care of my friend then. Thank you! I agree with you, Timotheus. Unless we have the time to spent with our furry friend, it will be very unfair to them. My daughter has been asking for a dog and I won’t allow it till she proves to be fully responsible. Hope she will get there. Thanks for dropping by and all the best for your business. I have a dog and sometimes he eats the plant. I thought it was not good and the plants were good for people. Now I’ve learned that plants are important for dogs and it’s good to give to my dog herbal supplements in the diet. This is a very informative post. Thanks for sharing. Hi Maja. The first time I saw a dog ate grasses, my mother told me that it is not feeling well. I didn’t really take notice then but after doing some searching on this topic, found out that it is so true. If you intend to use any herbal supplements for your dog, please remember to get the veterinarian’s advice before proceeding. Hi Sharon, informative article. I love the Rosemary wash idea, I was thinking it would be great in a spray bottle too. Anything to help keep those bugs away. I definitely try to be mindful of what fruits and veggies – now herbs are safe for our dogs. What’s even more interesting is that even something safe for dogs is not always safe for other animals. I thought it was interesting about Cinnamon too, it seems so fragrant and spicy, I would not have thought of that one myself. Thanks for sharing! Thank you for visiting again, Tara. I agree that the rosemary wash is a lovely idea. Can you imagine the fragrance of rosemary lingering after applying? 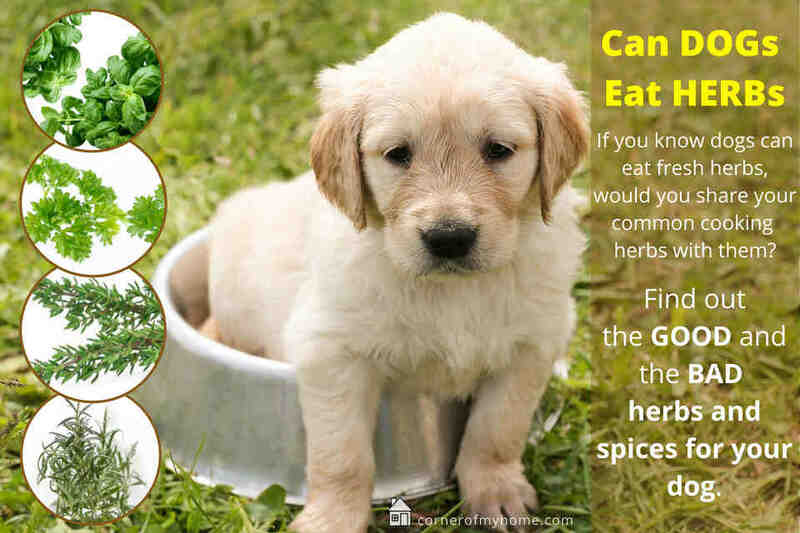 It is always advisable to check which herbs and spices are safe or unsafe for dogs before proceeding to share with them. Also, test for allergies. All of us, humans or dogs react differently. Also, bear in mind that too much of anything is actually not good. Moderation is BEST! Wonderful article Sharon! 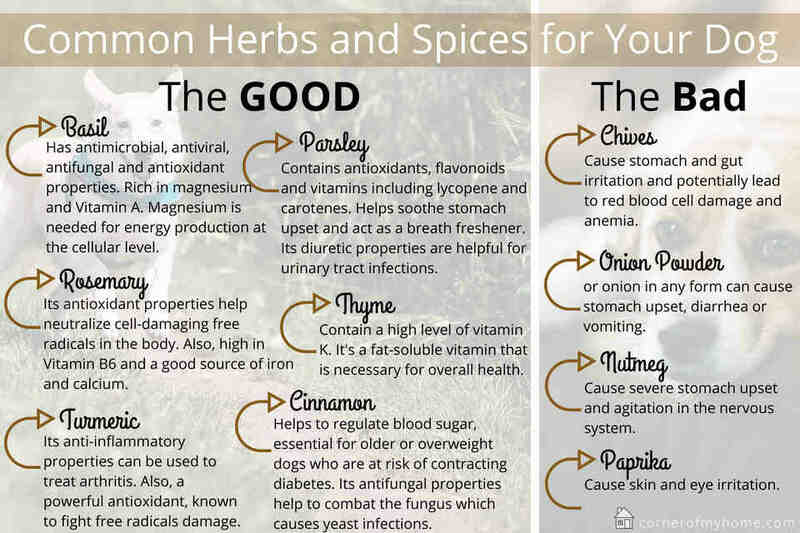 I did not realize that herbs could be so important for our fur babies! I’m going to start giving them to my little Lola! Her veterinarian has said she has an allergy to certain foods such as chicken and beef and we put her on a prescription medicine. I have not seen any improvement. She actually has what I would consider a yeast infection which causes her to itch. I’m going to try some of your suggestions and see if that will do the trick. I have a feeling it will! Sounds like I need to purchase some of the cinnamon you have suggested. 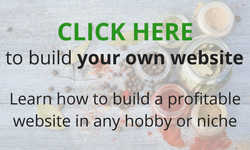 Thanks so much for a very informative and useful article and I will bookmark your site so I can come back again! Thank you for your positive feedback, Brenda. Since little Lola is prone to allergy, remember to start using the cinnamon on a smaller amount. Take extra notice of any reactions before taking it on a regular basis. Hope she gets better. I would never have thunk about spices for dogs…I especially like the rosemary wash you talk about. What a great way to give my dog a nice aroma while helping to fight off nasty ticks! I like the rosemary wash too. Such nice aroma. Thanks for dropping by, Anne. Hi, I’m Trixie and I love to eat grass. Really it is a weed that I eat, not the regular lawn grass which would be good, because then my mom wouldn’t have to cut the grass! My mom does grow Thai Basil, but didn’t know I could eat it. She likes the idea that rosemary would keep some bugs off me. We wonder if it works on mosquitoes and horse flies? They are really bad in south Alabama and bother me alot. She sometimes puts turmeric in my homemade dog biscuits when she makes them and could add cinnamon too, but we have to see what kind we have. And you are right, what is good for one dog may not be for another. I think she is going to add more herbs and spices to my dog biscuits now that she knows what is good and safe for me. Thanks for increasing our knowledge. Hello Trixie. Thanks for dropping by. I am so glad your mom is making homemade dog biscuits for you, with turmeric in it. Surely you are very healthy. The rosemary spray does help to repel mosquito and house fly as well. Basil does the same. Since your mom is growing basil, if she has more than enough for cooking, consider making basil spray. Simply put 4-6 ounces of fresh, clean basil leaves to 4 ounces boiling water. Steep for a few hours. Strain and squeeze dry the leaves. Add 4 ounces of vodka into the basil water. Mix thoroughly and store in the refrigerator. Spray outdoor when going out. Hope this helps.